» Test/New Years Eve food. Don’t Eat Off The Sidewalk! First off, we have a test recipe from a cookzine that one of the PPK members is putting together. I made it once a few weeks ago but forgot to take pictures. 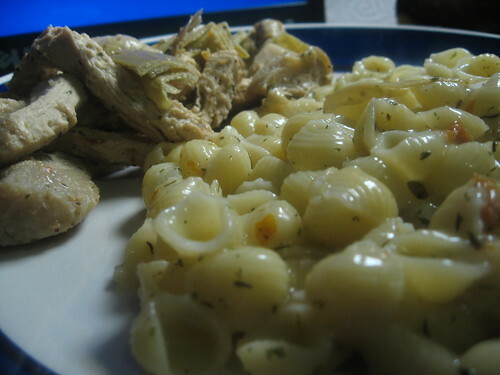 Sundried Tomato Cream Sauce, over pasta with some chik’n strips and marinated artichoke hearts on the side. I actually ended up not eating the artichokes because they were really bitter. Brian and I purposely made no plans for the new year. Sure, we have no friends in this state, but I really don’t like this particular holiday. Too much pressure to party party party. What if I just want to watch a movie or go bowling? Anyway, I decided we’d have a nice dinner and leave it at that. 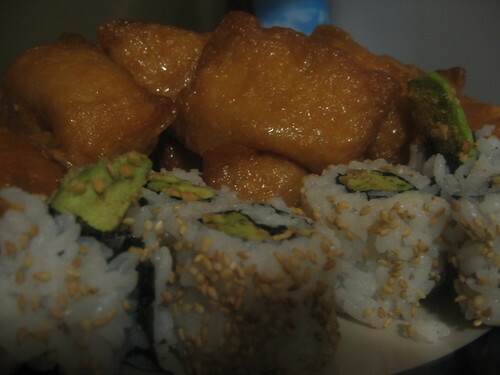 I went with an asian themed dinner. We had our favorite sushi, inari. I also made a single elephant roll, my first attempt at an outside roll. It went pretty well, I think. Then I made General Tsofu and broccoli to go with it. I was going to make the sweet and sour sauce from The Everyday Vegan, but Brian actually prefers this bottle Tso sauce so that’s what we have. Did I ever mention that there is no overhead light in our living/dining area? We have one lamp. Sometimes I don’t realize how dark it is in there until I have to take a picture. 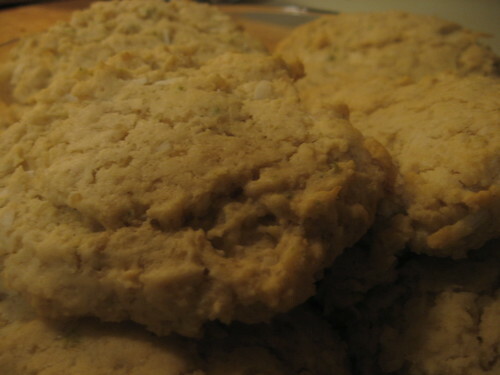 For dessert, I made coconut lime cookies from Vive le Vegan. They were really good, normally i’m a chocolate girl but Brian isn’t, and since I was trying to keep with the theme of our dinner I chose these. It was a nice change of pace.